As I am writing this fishing report, the first of the 2012 season, its hard to believe how fast the last eight months have passed. This past winter was normal for the Gaspe. We had an average snowfall along the coast and good snow pack in the hills. I receive many calls over the winter from clients inquiring about how much snow we have. The comments I receive are " Ah, that should be good for the rivers" I have been in the salmon fishing world for over 30 years and I have come to learn that the amount of snow we receive during the winter has no effect on the rivers levels during the season. It strictly depends on the amount of rain fall we receive during the summer. 2011 was the wettest season I can remember and our rivers remained high the entire season. The 2012 season is now upon us and our water levels are low for this time of year. Lets hope we get some rain over the next week or so. Our guides have been out on the rivers since late May, checking out pools and runs. Early reports from the Bonaventure are that we have fish in early! Mario and John floated the upper sectors on June 1st and saw fish in a few Pools. Matt and Carol saw fresh run fish in the lower river and in a couple of our lower pools. The Grand Cascapedia has been doing very well from opening day with salmon being caught on all the sectors. The branches fished well the first few days of June but now are a little too low. The Petite Cascapedia look great and fresh salmon have been seen in the lower pools, very early for the Petite. Larry and Roddy drifted our upper sectors of the Grand and saw fish in few pools. Well its Sunday the day I generally send our weekly reports. The camp has only been open for two days. Our first guests arrive on Friday and fished yesterday, I told them it was very important that they catch fish or I wouldn't have anything to write about. I am pleased to report they didn't let me down! The fly's that have been working are the Stone Ghost, Blue Charm and Silver Rat. Tube flys also did very well. Its a bit early for dry's, but if the water warms a bit, hang on! 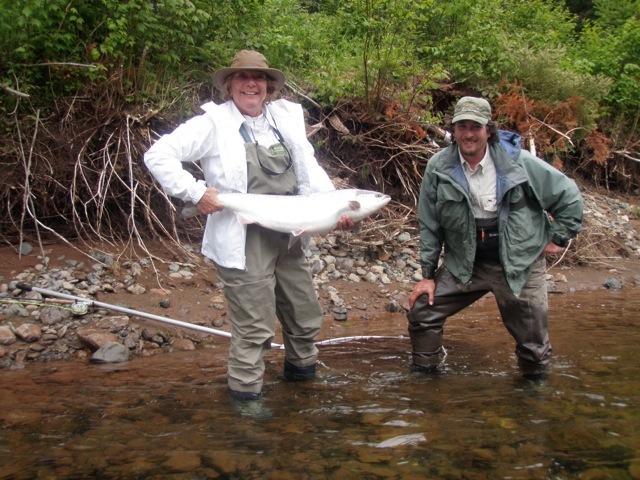 Nancy Garrett with Salmon Lodge guide Pat and her first Atlantic Salmon, congratulations Nancy!